Story Creek Outfitters - Southern Colorado's Premier Private Ranch Big Game Hunting Outfitter. 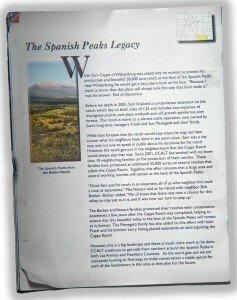 …all the way to the 1870’s when this part of Colorado was as raw as any part of the American west could possibly be. In fact, it still remains very much as it was…way back then. We like it that way, intend to keep it that way, and that’s just the way it is. As we did in the old days, we raise cattle; they’re our main crop. The wildlife that has always called this vast, 40,000 acre ranch home are of the same genetic stock as the elk, deer, bear, pronghorn antelope and turkeys that were here…way back then. We aim to keep it that way, too. We’re about two things: cattle ranching and hunting. That’s enough, and we like it that way. We think you will, too. Samual J. Capps founded the ranch in 1878. 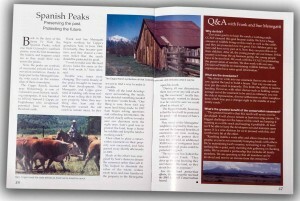 Sam’s ancestors worked the ranch as the Capps Ranch all through the 20th century. In 1968, Frank and Susan Menegatti came to the ranch to work, eventually partnering with old Samuel Capps’s grandson, also appropriately named Samuel. Sharing grandson Sam’s profound wish that the ranch remain intact, forever unmolested by development, both families embarked on making it so by placing a conservation easement on the entire ranch. 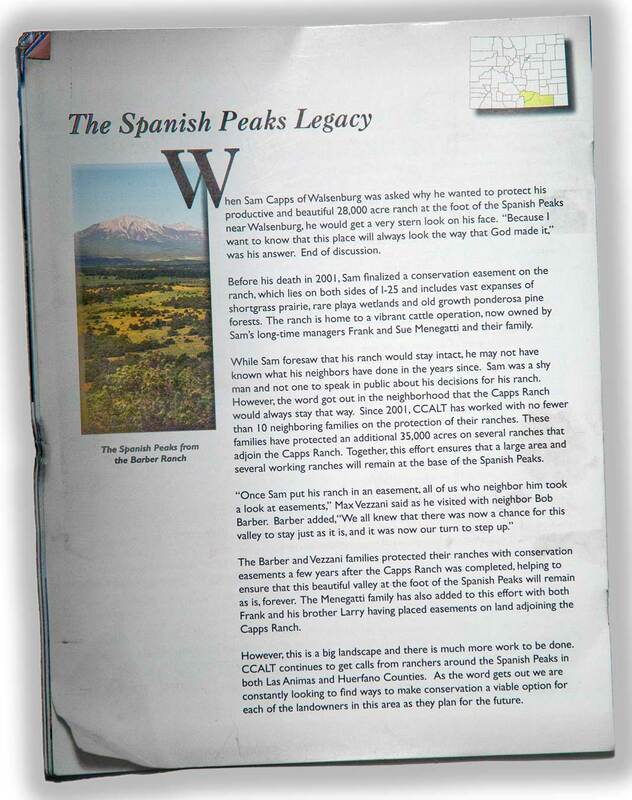 In 2003, two years after Sam passed, Capps Ranch was awarded the Leopold Conservation Award as a result of the Capps’ and Menegatti’s management of the thousands of deeded ranch acres, enabling wildlife numbers to steadily grow each year. Their effort resulted in a 50% overall increase in wildlife population and improved wildlife quality. The Leopold Conservation Award Program recognizes agricultural landowners actively committed to a land ethic. Working with prominent state conservation partners, the Sand County Foundation presents the prestigious honor in settings that showcase the landowners’ achievements among their peers. The former Capps Ranch, now known as Menegatti Ranch, has been formally recognized by the Land Trust Alliance, a national conservation organization that works in three ways to save the places people love. 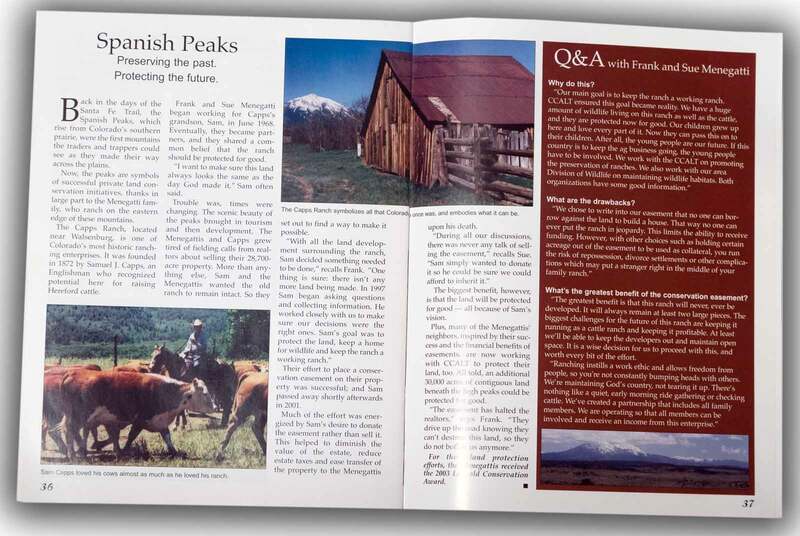 As well, the Colorado Cattleman’s Agriculture Land Trust (CCALT) recognized the ranch for it’s forward vision in saving the ranch’s land from development.